Posted: August 19, 2010 8:06 p.m. Updated: August 20, 2010 4:30 a.m.
Chelsea Schaefer, 21, of Palmdale, watches after Lobo at Wolf Connection in Agua Dulce on Wednesday. 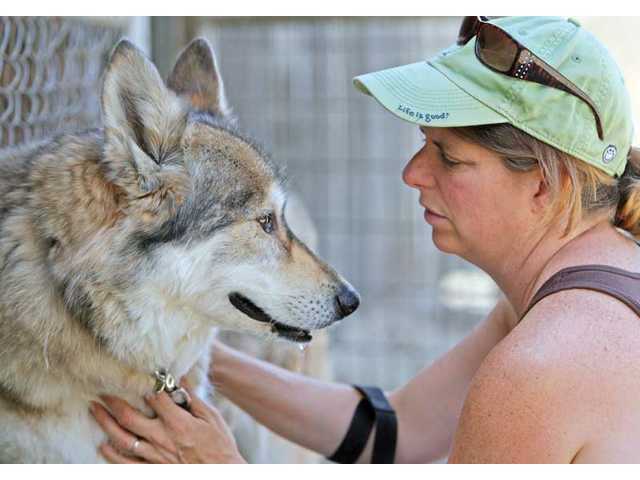 Santa Clarita resident Stacey Nivichanov spends time with rescued wolf dog Abeka at Wolf Connection on Wednesday. Nivichanov has been a volunteer at the center since last August. 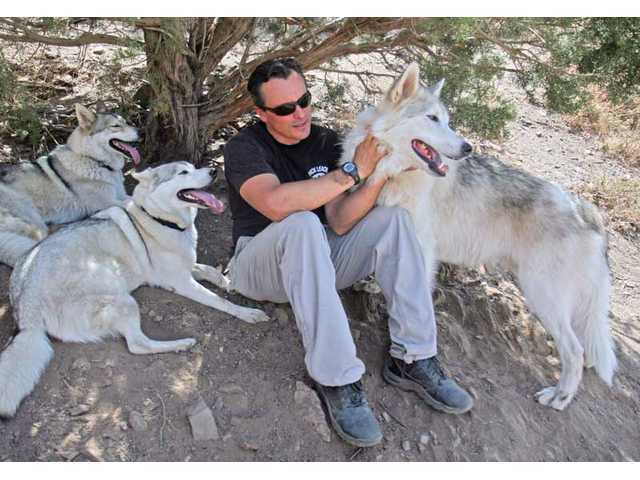 Alfero, founder of Wolf Connection, an animal rescue in Agua Dulce that specializes in wolf dog breeds, plays with a pack that the center takes care of. To learn more about Wolf Connection, its school presentations or how to volunteer and donate, call (310) 838-0716, e-mail [email protected] or visit www.wolfconnection.org. The nonprofit organization is especially in need of donations as part of its move to a new location in Acton. Lobo didn’t have much of a chance at living his golden years in comfort. The 19-year-old domesticated wolf was old and had become a problem for his Tehachapi owners as he began escaping and killing a neighbor’s chickens. Over time, the lean, white wolf grew thin and malnourished. But lucky for Lobo, volunteers from the Wolf Connection rescue group in Agua Dulce stepped in. Teo Alfero’s wolf- and wolfdog-rescue organization sits on nearly 3 acres, caring for Lobo and about 20 other wolves and wolfdogs. Some of the animals can eventually be adopted out, but for many, they’ll spent the rest of their years there. For Alfero, establishing Wolf Connection wasn’t ever a life goal. His initial passion was helping children in need, evident by his nonprofit organization Spring of Evolution, Inc., which he runs from his home in Culver City. But things changed about a year ago when he visited Villalobos Rescue Center in Agua Dulce. His plan was to find a playmate for his wolfdog, which is a mix between a wolf and a dog. “I just couldn’t leave,” Alfero recalled after visiting the dog rescue. The visit served as a source of inspiration as Alfero recognized the need to help wolves and wolfdogs. Along with establishing a rescue, he realized he could use the organization to teach kids about nature while learning about self-responsibility. 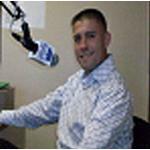 For the last year, Alfero has been building his nonprofit organization on the property he shares with Villalobos. “This is about connecting kids with nature, the earth and animals,” he said. He counts about 20 wolves and wolfdogs, which have been rescued from homes, streets and animal shelters. In the next two months, Alfero will be moving Wolf Connection’s entire operation to a 30-acre location in Acton, where he can take in more animals and expand operations. Most often, people adopt wolfdogs as puppies. But they soon grow into large animals that can live up to 20 years in captivity and scale six-foot fences. “You don’t realize they are going to grow into a 200-pound animal,” volunteer Chelsea Schaefer said. Alfero and his staff of about 15 rehabilitate the animals and train them on how to interact with the public. From there, he organizes school and community presentations as a way to for kids and adults to learn about wolves in interactive assemblies. “It brings them out of their shell,” Schaefer, 21, said. Most of Wolf Connection’s volunteers are young adults who share a passion for animals and nature. Volunteer Renee Dutcher, 18, is studying in Moorpark College’s Exotic Animal Training and Management program. The Acton resident looks forward to her time at Wolf Connection. “They’re just so excited to see you,” Dutcher said, adding that the wolves are always quick to howl at the volunteers each time they pull up in their cars. “I don’t know anyone who leaves here after a day without a smile on their faces,” Dutcher said.